Romancing the Bead: A beautiful garden-inspired art glass bead line in sterling silver. Comes ready-to-wear on beautiful sterling chain in seafoam moire gift box. 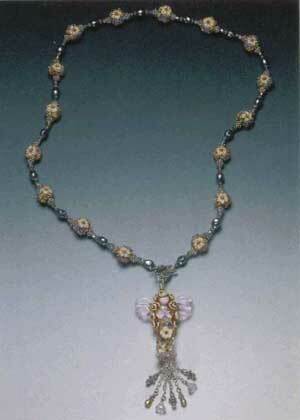 See Lea's new "Romancing the Bead" series at a show near you (see schedule). 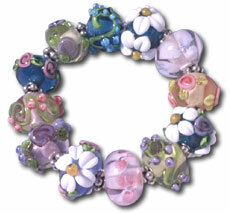 Spring Garden Beads: This is one of my most popular styles. In soft, romantic shades of ivory, lavender, rose blush, and spring green, these surface-embellished beads are perfect in Victorian-inspired jewelry, accented with freshwater pearls, crystals, and Bali silver. Large focal beads and vessels are hollow with all-over surface embellishment of flowers and vines; smaller sizes are also available. Tropical Garden Beads: This is a new series of beads for me featuring a large, flattened-round "tablet" shape that is very dramatic and elegant. The beads have a black core accented with golden adventurine, spring-green vines, and large tropical flowers, each with a tiny air-bubble forever captured in its center by a heavy encasement of sparkling crystal. The flowers are available in many colors. Sea Garden Beads: This is also a new style bead for me. The base bead is black with a dichroic coating and features floating "seaweed" and colorful sea blossoms in magical color combinations, no two ever alike! Each little fantasy underwater scene is heavily encased in sparkling crystal for a paper-weight effect. The Sea Gardens were inspired by Pati Walton's wonderful aquarium beads and the intriguing "gizmos" first introduced by Bud Mellichamp of Chimera Glass. Garden Minis: The garden minis are small floral beads in a gardenful of floral shades! The minis are available in a set as shown or individually by special order. Hydrangeas: The hydrangeas are a new line of beads inspired by the wonderful blue hydrangeas which bloom profusely in Cape Cod in the summertime! The hydrangea beads come in a variety of sizes from a large asymmetrical hollow (approximately 1 1/2 inches in diameter) to a small size suitable for bracelets or earrings (approximately 1/2 inch in diameter). The hydrangea beads are available in a variety of garden hues. This is a sampling only of bead styles available. To see a full range of Lea's current work, please visit her at a bead show near you ( see schedule).